When life gives you lemons, maybe don't make a nonsensical musical about them and their immigrant orange slaves. Huh. I was pretty disappointed by this one, especially because it was the only feature-length stop-motion film (and y'all know how I love me some stop motion) and its plot looked really interesting. The film (inexplicably) begins with a tomato-man who promises to tell his audience the story of Maroc Orange. Maroc Orange and several others are sneaking into a foreign country by way of sailboat. When the boat is attacked by sharks, only Maroc survives, and is mistakenly apprehended by Mr. Limone to become a worker in his tomato fields. Limone's daughter, Lisa, is a bratty teenager who's looking to find love, and is sent to Maroc's rescue by his friend, an opera-singing seashell. Their fates are held in the air as things come to a head at the plantation. "Lisa Limone and Maroc Orange: Totally Armulugu"
1. The first scene is pretty insanely moving. This is not a film where cartoon logic exists. 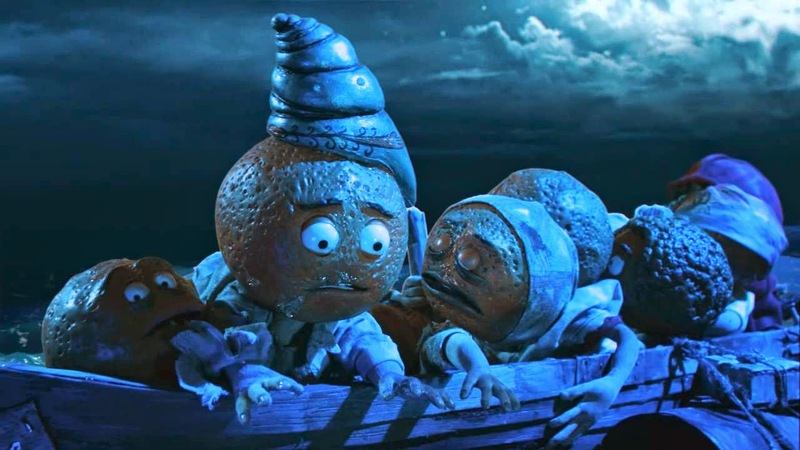 After a very realistic look at these poor oranges taking flight by way of sailboat in open water, we are next greeted by the harsh reality of their shipwreck. While the images are made of clay--and yeah, they're also oranges--there's something about the realistic fantastical gore of these poor things that makes the imagery effectively disturbing. Whereas human gore is a bit of a shock and 2D imagery might not be as effective, this opening scene really set the film up to be something hugely different. 2. I really liked the tunes. Each character has a different style of voice and song. Maroc's songs are very clear and natural, Lisa's are very pop and up-tempo, then there's the robotic songs of the lemons, and the operatic voice of Maroc's friend the seashell. I kind of wish they had broadened the songs to be about wider themes rather than honing in on an unimportant character's life (i.e. 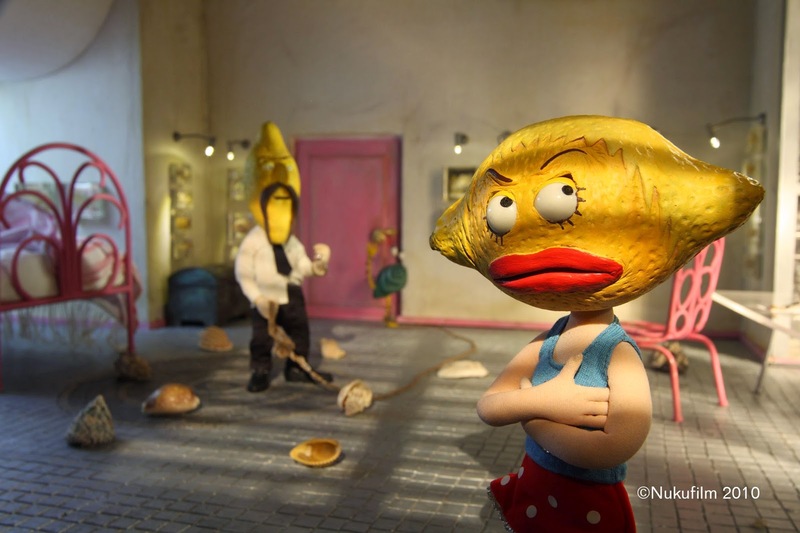 the lemon guard) or just cut down on the characters, but what can ya do. 3. I liked the stop-motion. While it's not as advanced as some of my faves (see Coraline or Paranorman) it's always refreshing to see someone who has the time to finagle a movie like this, so hats off to them for that. Taking off for a foreign country in a boat does not look awesome. Other than that, I found the movie to be a bit confusing. I'm a huge fan of magical realism done right, but there are so many elements of this that it weighs down the plot and becomes bewildering. Like okay, there's a tomato-man telling us this story. Cool. Tomato man talks about a ketchup factory. A little weird, since that forces the audience to reconsider what is considered a tomato in this framework. Are all the tomatoes sentient? If not, then why is this one? Continuity. Same thing with the seashell. For some reason, the filmmakers made it so that all seashells in this unnamed place can play pop music. Why? No idea. This does create a distinction for the opera-singing seashell. But at that point the could've eliminated all of the shells and just had that one guy and still have the stoy make sense. Another thing that bugged me was the story structure after Maroc is apprehended by Limone's Ketchup Factory workers. I'm not sure if it was time constraints that held them back or if it was an overactive imagination, but having Lisa Limone pursue Maroc with the notion in her mind that she'll finally have a teen love who will appreciate her seems weird. Points for going outside the box and maybe trying something more realistic. (Let's be real, people marry for the wrong reasons all the time in real life.) But within the framework of the story it just seems weird. After hearing the seashell's sad song of Maroc's past in his native country, Lisa seems more compelled to help him because it would be like a storybook than actually having compassion for his situation. The whole movie is just very odd. And while I'm a fan of things that go outside the norm, this was not in a good way. 5 outa 10. Would be lower, but I do admire stop-motion and this movie is pretty well-made on a technical level.